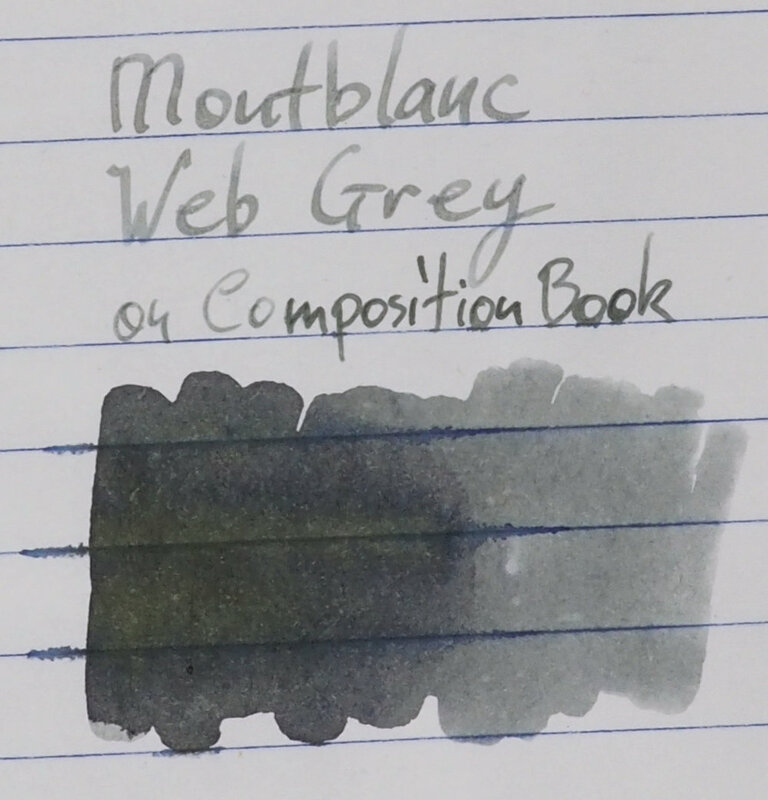 Montblanc Web Grey is a light grey ink that leans slightly yellow and ever-so-slightly green depending on the paper but it can also lean a little blue depending on the paper. Most papers displayed a yellow lean. 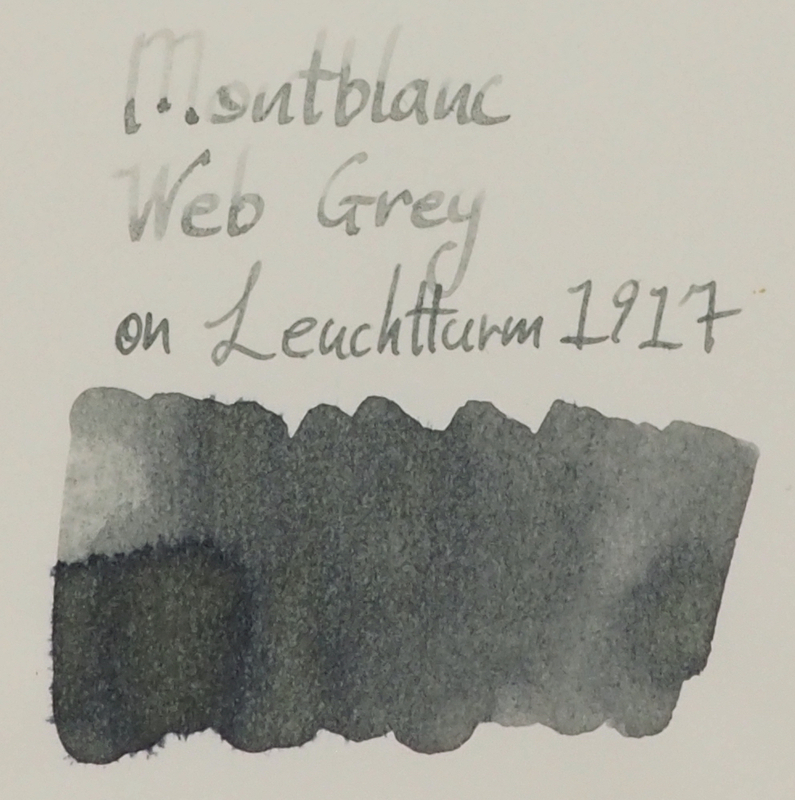 I would still describe this as a neutral grey, especially due to how light the ink is. The lack of saturation and vibrancy neutralise the already subtle yellow and green or blue leaning to the colour. And this ink is a quite light ink in a pen. A wetter pen will give the ink light to moderate shading but in a pen that is somewhat dry the ink becomes very light. 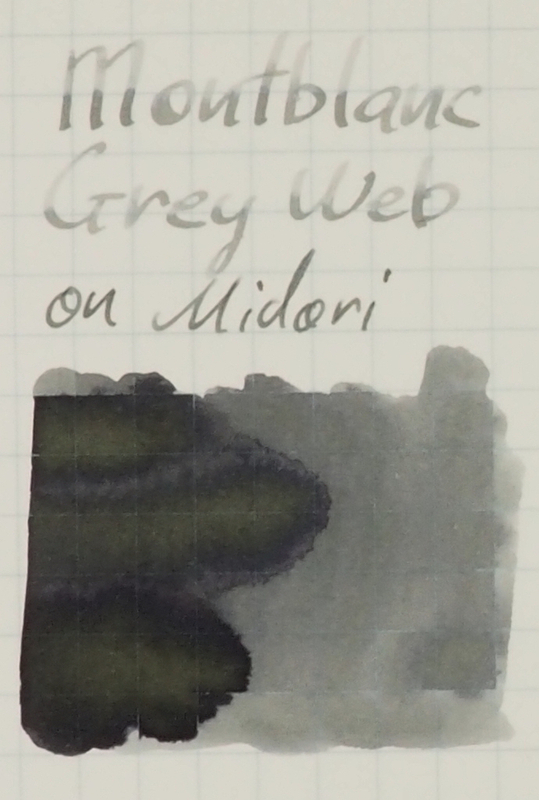 The ink has decent shading but I have marked it as low-moderate and moderate because while there is frequent shading the contrast of the shading is quite low; that is that the darker shade isn’t that much darker. This is primarily due to the lightness of the ink. There is absolutely no sheen at all. This ink has good performance in terms of feathering and bleeding which isn’t that surprising given the that it is a dry ink. 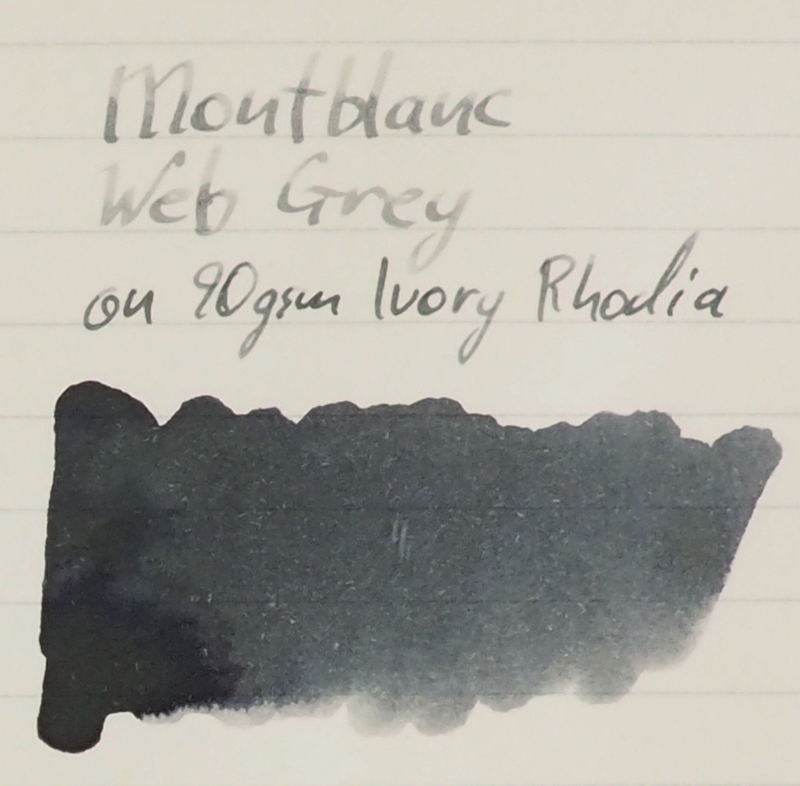 Montblanc inks I would describe, by today’s standards at least, as generally on the dry side. There is some variation within the lineup but overall I find that they are dryer than many other brands. This ink is on the dryer side of Montblanc’s inks. I categorise this as a dry ink with dry flow and low lubrication. This dryness, while not something I personally enjoy, did not affect actual performance on all but one paper typer. 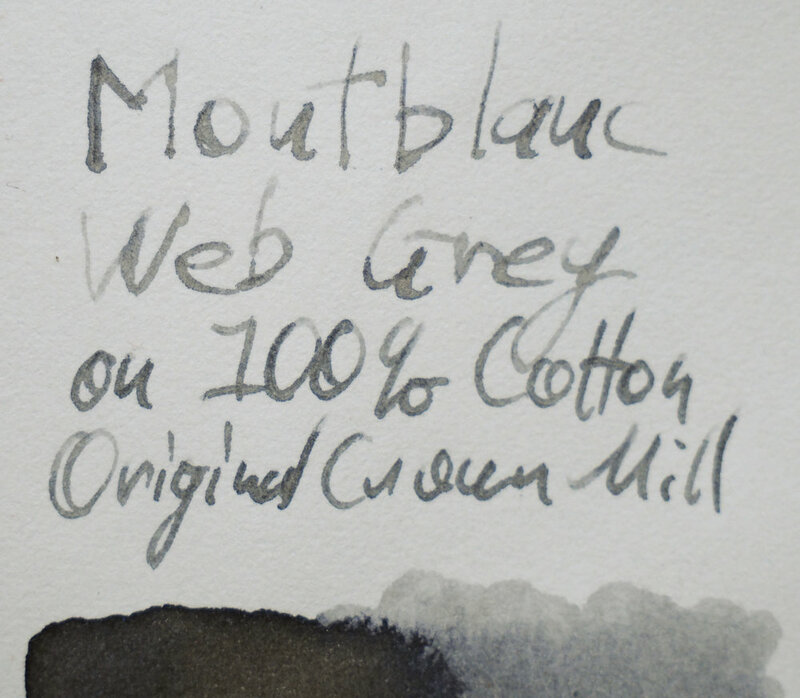 On Original Crown Mill 100% Cotton paper and in the Montblanc Heritage 1912 the ink struggled with flow. Hard starts and and week lines. The nib is a broad italic nib so downstrokes should be quite wide but you can see in the “t” of Montblanc that it is far from a broad stroke. 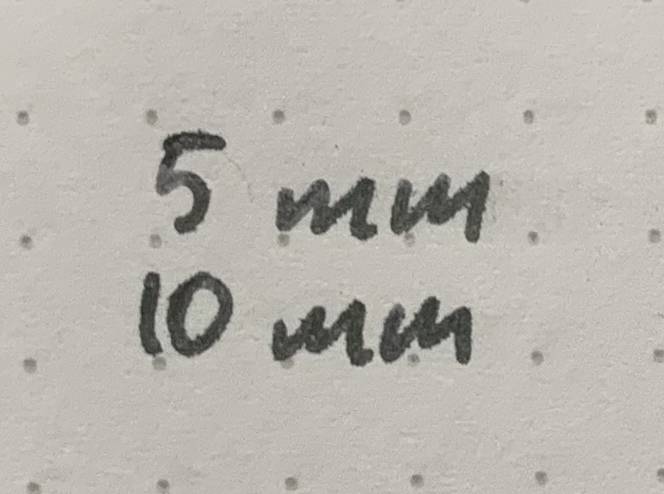 The “M” in Montblanc also required multiple strokes to get a proper line down. 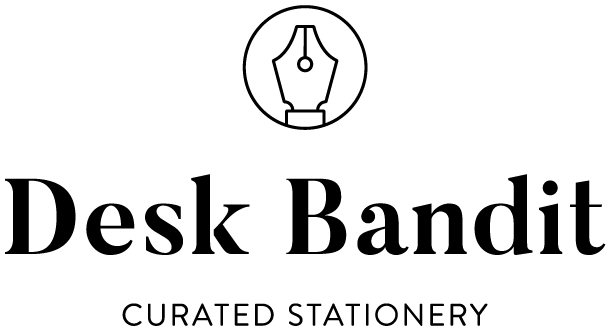 I didn’t have this issue with any other papers and I should note that the nib on the Montblanc is a customised Cursive Italic by Mike Masuyama. The pen is a dry pen and while this is apparent with other inks I haven’t yet had these issues with another ink. 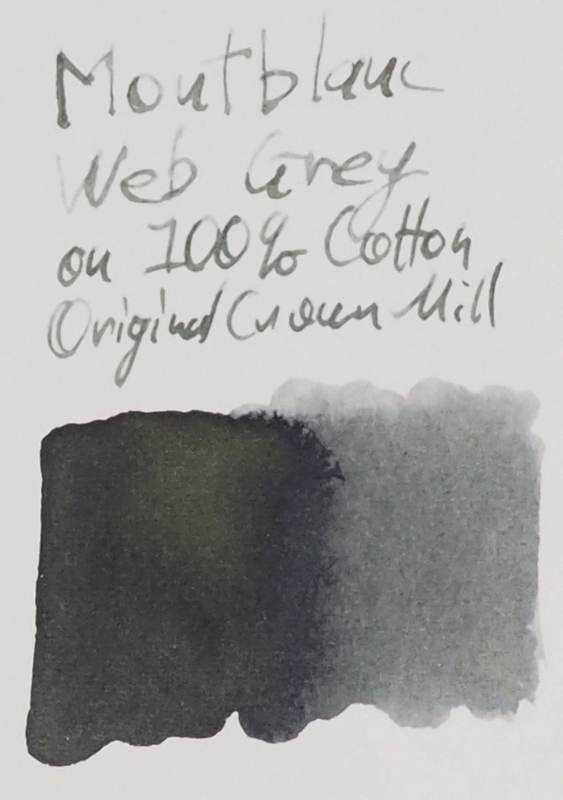 The chromatography, somewhat interestingly due to the yellow and slight green lean on many papers, started with a very neutral grey and moves through to a low saturation royal blue like colour and no visible yellow or green. Dry time is, as expected due to the dryness, very quick on Rhodia; pretty much dry after 5 seconds. 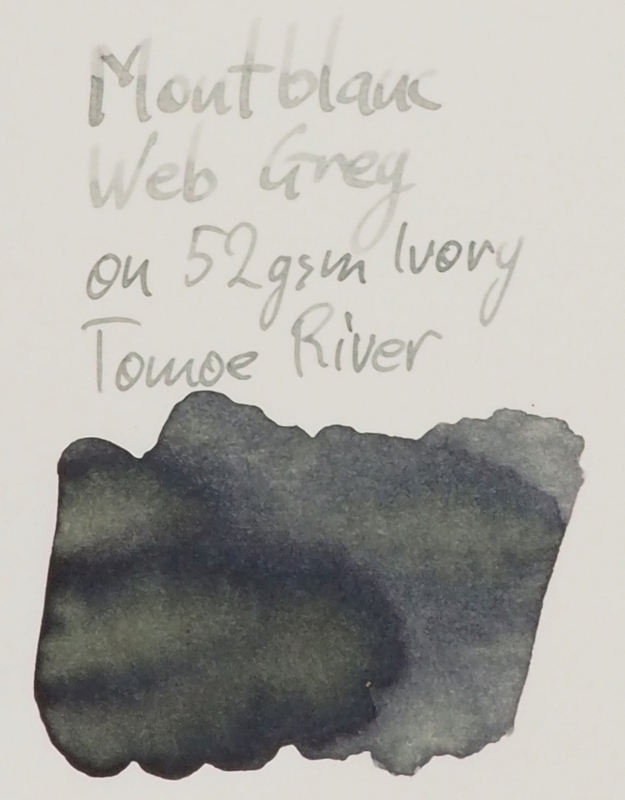 A little surprising is long it took to dry on Tomoe River; 60 seconds for an ink this dry is hefty! The water resistance is a surprise for sure. It isn’t 100% resistant like some inks but water takes very little away from the ink. It remains pretty unaffected by the water. The blue present in the chromatography is definitely more present on Rhodia with the ink leaning a little blue here. The ink is still very light here in a pen. The Kaweco fine nib darkens the ink decently well. 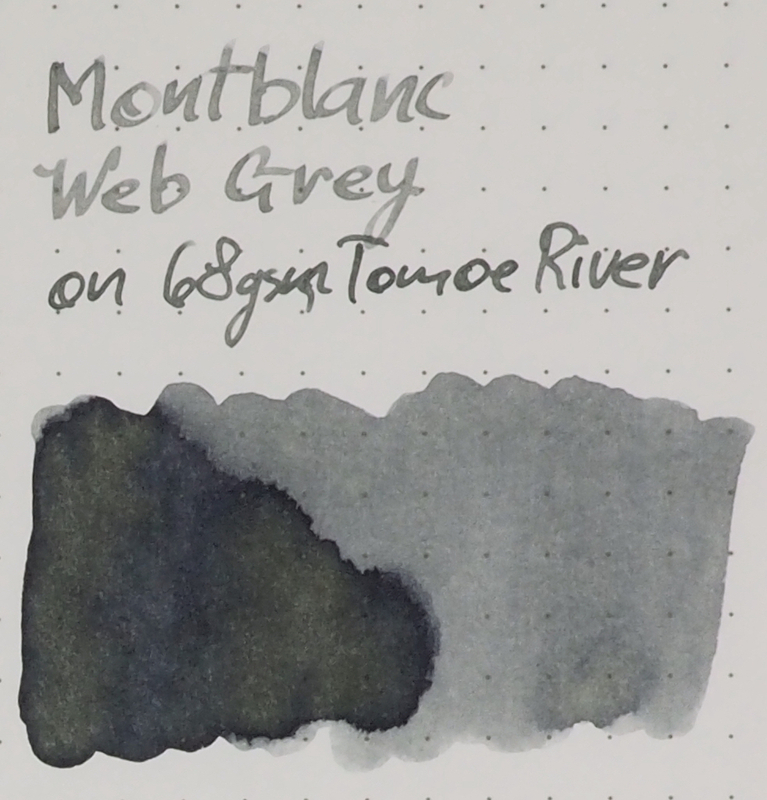 Kobe #59 Romance Gray is way too dark. 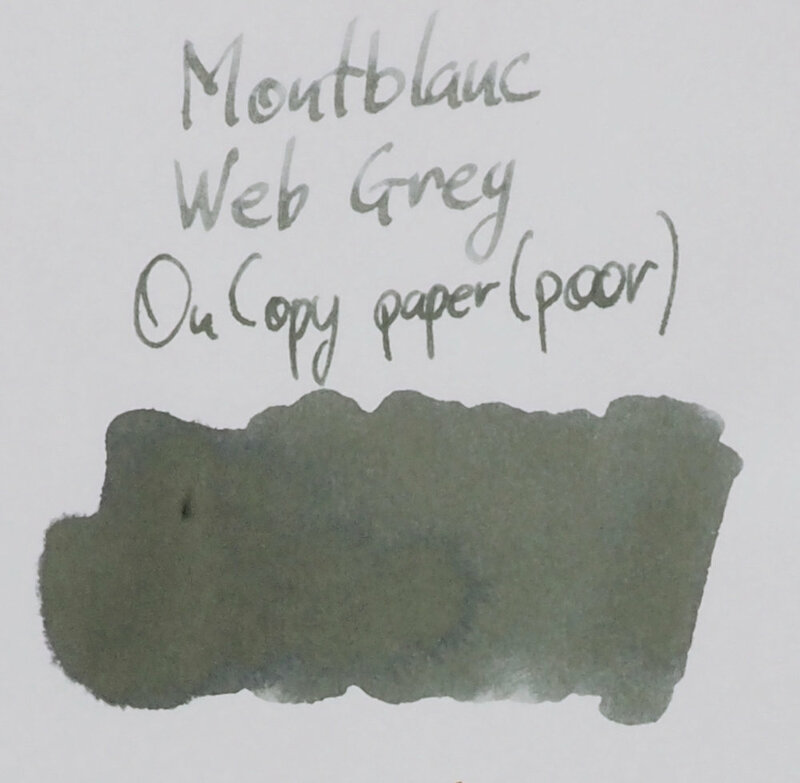 The pick for me is quite easy: Montblanc Oyster Grey is the closest in colour darkness and performance. The yellow and green is quite prominent on 52gsm Ivory (which is the whitest) Tomoe River. 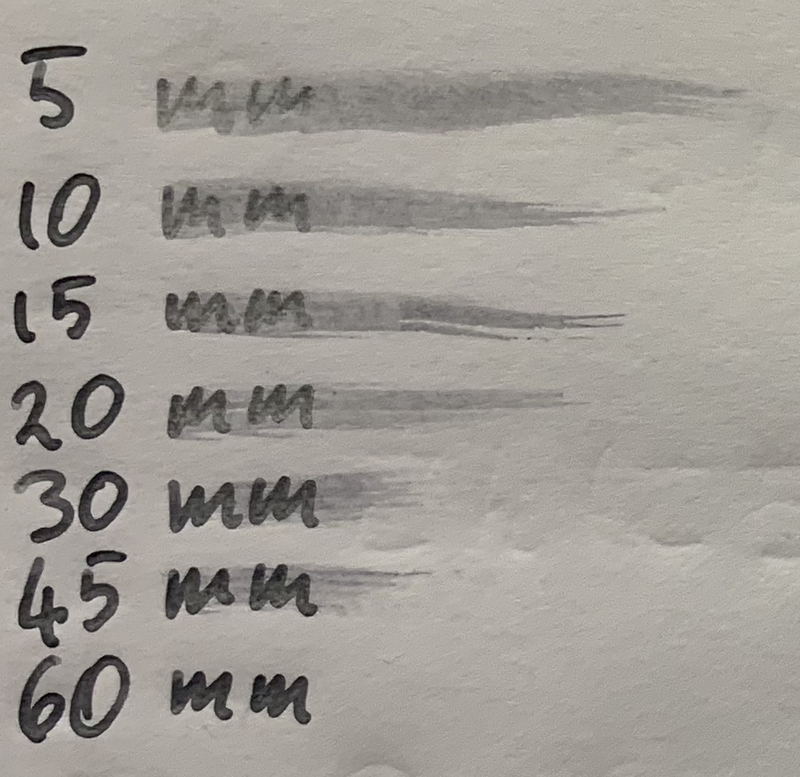 The difference between the wetter Kaweco Fine nib and the drying Montblanc is less prominent on Tomoe River compared with on Rhodia. It’s more difficult to pick an ink here based on colour. Only Einstein leans a touch green but that’s where the similarities, minimal already, end. 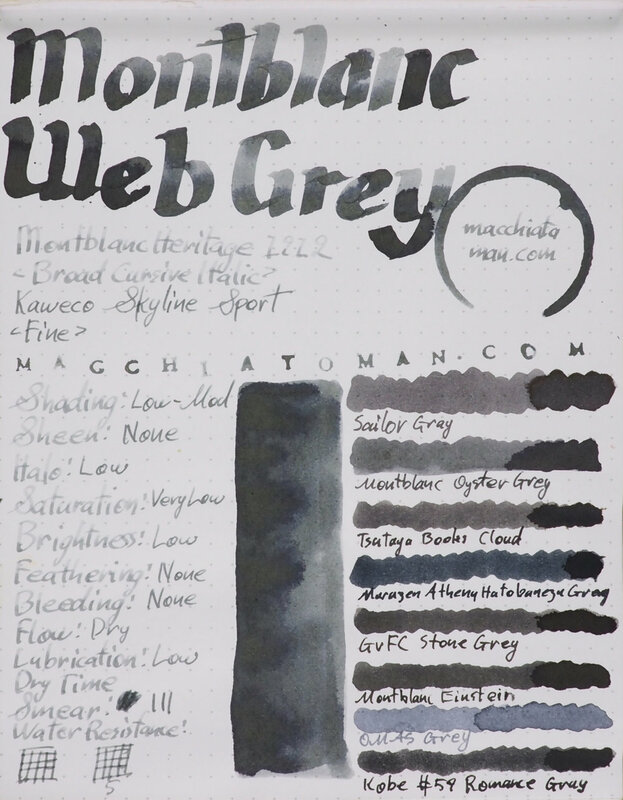 I would have to pick Oyster Grey again even though the hue is different, the lightness is similar and so is the performance. I like the colour of this ink. 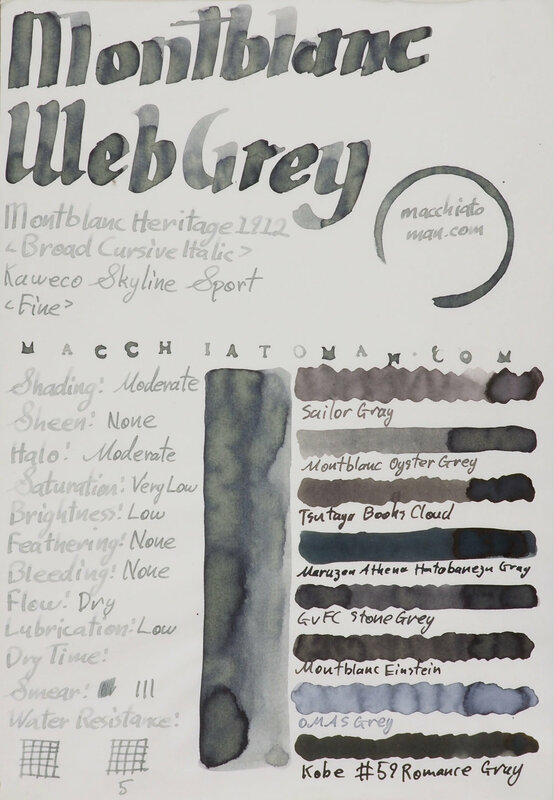 Its mostly neutral and doesn’t lean blue or purple (which I, personally, don’t really like, as much, as a hue to lean for my greys. Unfortunately I don’t like dry inks and for me this is way to dry. 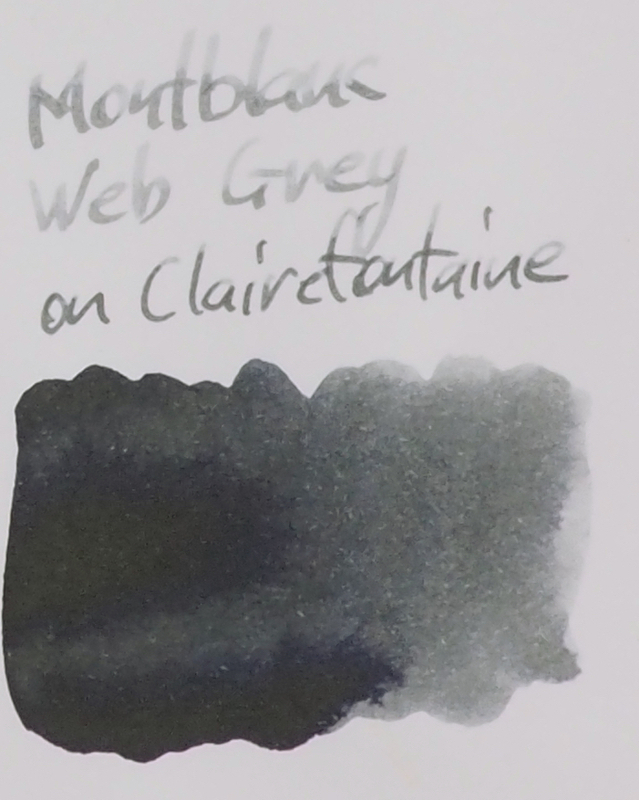 I don’t think dark greys are particularly useful as a “grey” ink as they are far too close to a black so I do like some lightness to the ink but for me this is just way too light and I put blame almost entirely on how dry it is. 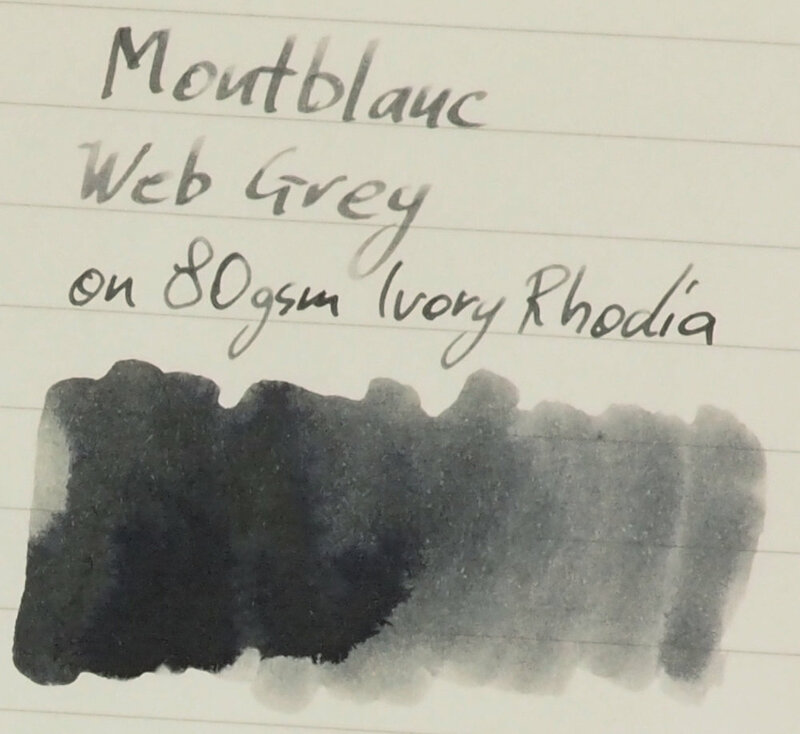 I wish Montblanc made their inks wetter, personally; I’d certainly get more use out of them but if you are going to use this ink especially I recommend only putting it gushers I think finer (but not too fine) nibs would work best. The water resistance was a surprising boon to this ink. If water resistance is important, this ink offers decent protection from water accidents! I bought this ink from La Couronne do Comte so if you are interested in the ink I recommend checking them out.